Law Corner (www.lawcorner.in) Started its journey in the year 2018, with the objectives to provide smooth platform to law students to boost their knowledge. Visitors will find a wide range of features including Judgments, Articles, Latest News updates, Career Advice, Questions and answers for competitive exams, Seminars, Legal Events etc. Lex Research Hub (www.lexresearchhub.com) is an online learning platform for the legal scholars, founded with an objective to provide study materials, job related information, information relating to curriculum activity, guidance for the competitive examinations and offer courses for the students of management, law, social sciences and professionals. Navtej Singh Johar & Ors. v Union of India Thr. Secretary Ministry of Law & Justice,[ WP (Criminal) No. 76 of 2016]- (Sec. 377 DecriminalisationCase passed on 6th September 2018). 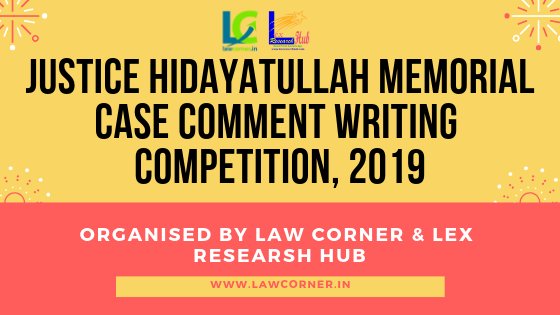 All submissions must be sent as .Doc or .Docx files to [email protected]er.in.The title of the Soft Copy of Case Comment must be in the following format: “Justice Hidayatullah Memorial Case Comment Writing Competition, 2019”.